Great quality and pretty. Is exactly as described. 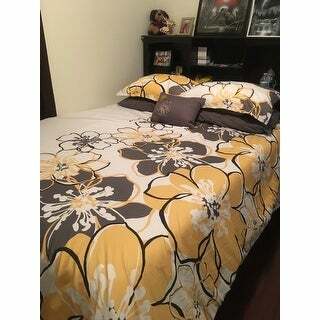 Let Mi Zone Mackenzie duvet cover set brighten up your room instantly with its vibrant yellow flowers and corresponding shams. Duvet cover and shams reverses are dark grey for a great background for the bright yellow flowers. Dark grey and black accent colors help to outline the oversized floral pattern and are used in the matching decorative pillow to tone down the bright yellow of the rest of the set. Made from polyester microfiber this duvet cover and shams are soft to the touch and machine washable for easy care. Duvet cover set does not include insert. Dimensions 90.0 In. X 68.0 In. X 0.13 In. Love this soft, chic, beautifully patterned duvet. I walk into my room and it makes me smile. I get so many compliments on it! I needed something in yellows and gray that would mesh with my decor without being too busy and add the right amount of color. 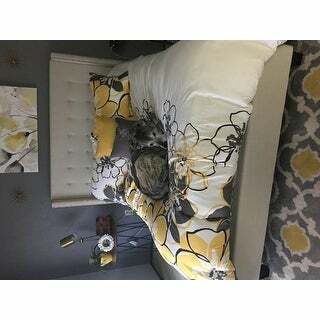 I also needed an easy care, dutable duvet as my 115lb Great Dane/Greyhound enjoys a good nap on my bed (which I also purchased at Overstock and love!). The duvet washes up easily and hasn't faded. As long as you remove it from dryer soon after its cycle, no need for ironing. It came with 2 shams and small grey patterned accent pillow. I added the yellow pillow for an extra pop. I would definitely recommend this product! I ordered the full/queen and when it came in I was in love. The colors are exactly as expected and the design is gorgeous. I didn't realize it was a duvet covet set so I was a tad bit surprised when I received it, but it worked out perfect! I love the colors! It adds amazing color and life to mt bedroom. Beautiful vibrant colors! The material is nice and soft. This cover will brighten any room. I would recommend this duvet. Beautiful, but really thin material. However, I used as a bed covering, not a duvet. It has tie strings attached to the inside corners, so not sure how that will work out when I do use as a duvet. I brought a full size set and love it! It came with a cute little pillow and the fabric is so soft and comfortable. I absolutely love my new bedroom duvet cover set! It was bright and super comfortable. All my friends that have seen it are super jealous. I just ordered a faux fur dark gray throw today to go with it! I just love this duvet cover!! It has a nice soft feel and it is striking when I walk into my bedroom. The colors just pop and make everything look classy.. Very satisfied with my purchase!!!! I love the quality and it easy to care for. I would recommend it to others. I purchased this set while staging my home for sale. The colors and design are really beautiful and vibrant. The material is quite thin but I now use it in my guest room in my new house . Well-made and fits nicely. I thought I had bought a comforter set rather than Duvet set so I wasn't expecting what I can only describe as a heavy sheet set. Perfect for the price. 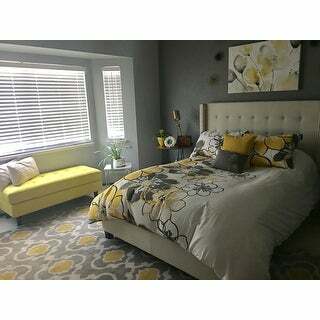 Used in a guest room, the white is white, the yellow is mustard. Very happy with this set, nice soft yet durable material. Easy to cate for. Wash and go with the colors remaining bright. Just wish it came in a king. Beautiful, just beautiful and good quality. "Is the color yellow or buttercup? The valences are shown as buttercup."